There is no such thing as a perfect market. Information is never perfectly symmetric. People are never perfectly rational. This fact is often used as justification for government intervention. But that is not an argument against markets. It is not an argument for government intervention. As markets grow, as people become more and more involved, as trial and error helps people determine the best course(s) of action(s), a market will move closer and closer to perfection. But it is asymptotic. Markets will forever move closer to perfection, but never quite reach it, just as humans will move ever closer to medical knowledge but never fully achieve it. Take, for example, information. Consumer information is never perfect for goods and services. For many years, consumers relied on word-of-mouth to get information on items. As anyone who has played the telephone game can tell you, it’s hardly perfect. But then along came printing, that allowed for things to be put into word. Newspapers arose, which allowed for critical reviews from places like Good Housekeeping, imparting more information. Still not perfect. Now, we have the Internet and countless services like Angie’s List, Yelp, consumer reviews, blogs, etc etc etc. Information asymmetry has diminished. Has it been eliminated? Heck no. But it has moved even closer to perfection. This is one of the primary virtues of the market. When something comes along to interrupt the market exchange of ideas, methods, and outcomes, it disrupts that process toward perfection. Citing an op-ed in the LA Times, you claim that science is not on the side of the NRA in the gun debate (Where does Science Fall on the Gun Control Debate?). This may or may not be true, but the facts you lay out in your article do not support this conclusion. For example, you cite “Of the 150 scientists who responded, most were confident that a gun in the home increases the chance that a woman living there will be murdered (72 percent agreed, 11 percent disagreed), that strict gun control laws reduce homicide (71 percent versus 12 percent), that more permissive gun laws have not reduced crime rates (62 percent versus 9 percent), that guns are used more often in crimes that in self-defense (73 percent versus 8 percent), and that a gun in the home makes it a more dangerous place to be (64 percent versus 5 percent).” None of this is scientific evidence. It is the opinions of the respondents. To be fair, these things may very well be true. They may be based on scientific evidence. It may be that strict gun control laws reduce homicide (although my own research and the statistics you cite in your article [specifically ” gun homicide rate has plunged by 49 percent since its peak in 1993″] run counter to this claim). It may be that guns are more often used in crimes than in self defense. These things may be true, but by presenting opinions as fact without any supporting evidence, you do a great disservice to your article and overstate the usefulness of the findings. Interestingly, in an article on science, you demonstrate very unscientific thinking. The Bureau of Labor Statistics released their annual “Characteristics of Minimum Wage Workers” report the other day. It’s quite the interesting read for an econo-nerd. – Just 3.9% of all hourly workers make at or below minimum wage. That’s down from 4.3% last year and significantly lower from the 13.4% level in 1979. – Minimum wage workers are young: Half of those making minimum wage are under 25. Most of them are teens. Of the 16-19 year olds making hourly wages, 15% were paid at or below minimum. That figure drops to just 3% for 20-25. -Education is a factor: 7% of those without a high school diploma earn minimum wage. That figure drops to 4% with a high school diploma, and just 2% for those with a college degree. So, in other words, the vast majority of workers, even those with low skills, are earning above minimum wage! What this also suggests to me is that the minimum wage could possibly be raised with minimal (and I stress minimal, not none) negative consequences as many workers are already making above the wage as it is. After all, if the price floor is below the equilibrium, it’s rather ineffective. Of course, this is not to say that there will be no consequences. Those handful of workers who do make at or below minimum wage would surely face consequences: loss of hours, loss of non-monetary benefits, possibly loss of jobs. I want to be crystal clear here: I am not advocating raising minimum wage (which I hold to be grossly immoral), but offering an explanation why hikes in the wage might show just minimal consequences. There’s some new interesting research coming out on who, exactly, are the super-wealthy in America. First, from Steven Kaplan and Joshua Rauh. Looking at the Forbes 400 (the list published by Forbes each year showing the wealth of the 400 richest Americans), Kaplan and Rauh found that the majority of the super wealthy in 2011 were self-made: 69% of those on the list were self-made billionaires, up from 40% in 1982. Conversely, those who inherited wealth fell from 60% in 1982 to just 32%. Now, to be fair, some of those who made their fortunes did inherit some wealth (for example, the Koch brothers or the Waltons), but they continued to expand their wealth by offering goods and services to individuals. The numbers are very similar when looking at the 2015 list: 69% are self-made, and a small proportion inherited their wealth. There’s also interesting info about inter-generational fortunes. It turns out, of the current 185 billionaire families in America, only 16 (8.9%) can trace their fortune back to the 19th Century. Notable names not on this list include: the Vanderbilts, Carnegies, Morgans (of JP Morgan fame), or Astors. Each of those families had wealth of over $100 billion in 2015 dollars. The Rockefellers have seen their fortune fall 97.1%, from $340 billion to $10 billion. What these figures tell me is concerns about concentrated wealth is America are largely overplayed. If anything, the American Dream is alive and well. Updated 23 May 2015 to correct a math mistake. “I think environmental advocates have done a disservice by trying to amplify heat by saying we’re going to be alarmists, we’re going to scare you into agreeing. People don’t scare into agreeing,” said Elisabeth Moyer, a University of Chicago climate scientist who co-directs the Center for Robust Decision Making on Climate and Energy Policy. Moyer makes an excellent point, namely that people don’t scare into agreeing. When people get scared, they naturally retreat to comfort positions. And that fear works both ways: for those whose natural tendency is to appeal to authority for solutions, they’ll quickly return to that, demanding government action or control. Those whose natural tendency is toward less government could act irrationally. Which leads me to a thought: why do so many people, primarily on the Right deny the world is getting warmer? Is it because Republicans are anti-science? No, scientific ignorance is pretty widespread. Perhaps Republicans are just more partisan? No, Partisan divide appears to be bi-partisan. Here’s my thought: They are afraid of the consequences. They fear admitting global warming would open the door to government to enact a wide array of laws which could interfere with human freedom to an epic level. This fear is legitimate (governments will use just about any excuse, real or imagined, to increase its power), but it shouldn’t be crippling. 1) The world is warming. It’s not warming as much as the climate models suggest, but the average temp is likely moving upward, according to NOAA. 2) None of the doomsday predictions made by climate scientists have come true. Liberty-lovers should take heart in these things. It shows what Julian Simon called “the greatest resource” is still alive and well: human ingenuity. Doomsday predictions are nothing new. Back in the 1970’s, they were all the rage. In the 1800’s, Malthus lit the intellectual world on fire with his End of Days predictions. But none of them have come true (in fact, the exact opposite has). All these people make the same mistakes that the environmental doomsdayers Dr. Moyer discusses at the beginning: they use linear projections, which fail to take into account humanity. Fear-mongering (and, at times, draconian levels of censorship) on the Left and denial on the Right are both obscuring what is needed to solve the problem: the free exchange of ideas. Human ingenuity has conquered the biggest problems ever faced: medicine, astronomy, literature, entertainment, weather. We’re conquering global poverty and hunger. If ideas are allowed to flourish, if people are free to find the best ways to help one another, than global warming, just like extreme poverty, disease, and hunger, will be just one more issue regulated to the garbage bin of history. Free the people. Save the planet. California is currently facing a massive drought. The situation has gotten so bad the governor has issued a ban on excessive residential water use. But is there a better way? Yes: markets. Remember that prices are signals. They indicate the relative surplus/scarcity of a good. When a good is relatively scarce, prices would naturally rise; conversely, when a good is relatively abundant, prices would fall. Water is currently relatively scarce in California. In a free-floating price system, the price of water would rise. The problem is California is not allowing prices to rise. This actually perpetuates the water scarcity as there is no incentives for residents and businesses to conserve. Furthermore, a ban of excessive water use doesn’t do anything to address this problem, either. The ban issued by the government only applies to residents and some businesses. Many firms, including agriculture (where the majority of water usage occurs) are exempt from the limits. In terms of combating relative scarcity, this method will, at best, have a minor effect. Prices, in contrast, fall upon all users of the goods, not just the un-politically connected people. If prices were allowed to rise for everyone, then the incentive to conserve would fall upon all: businesses, municipalities, and residents alike. These economic actors would have to look for ways to curtail their water use, allowing them to, naturally, adjust to the relative scarcity of water. Another bonus of rising prices that will not come from a ban is innovation. As prices rise, firms and individuals will look for ways to maximize their water usage while minimizing the costs. This can lead to innovation. Farms may look toward methods that use less water for irrigation (such as no-till farming). Individuals may look to replace old, leaky plumbing with newer, more efficient equipment. As long as prices are held artificially low, there is less of an incentive for this innovation to occur. California needs to look toward a decentralized, “bold and persistent experimentation” method to solve this water crises, rather than a one-size fits all solution. That can only be delivered by a market for water. 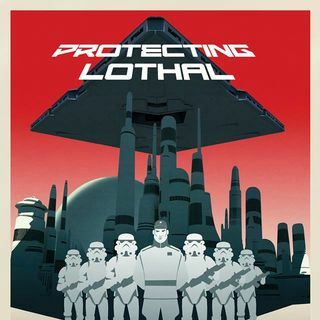 What do you call a group who rebels against legal authority, attacks civilian as well as military targets, and is generally comprised with criminal elements including smugglers, mobsters, and escaped convicts? Terrorists? Guerrillas? 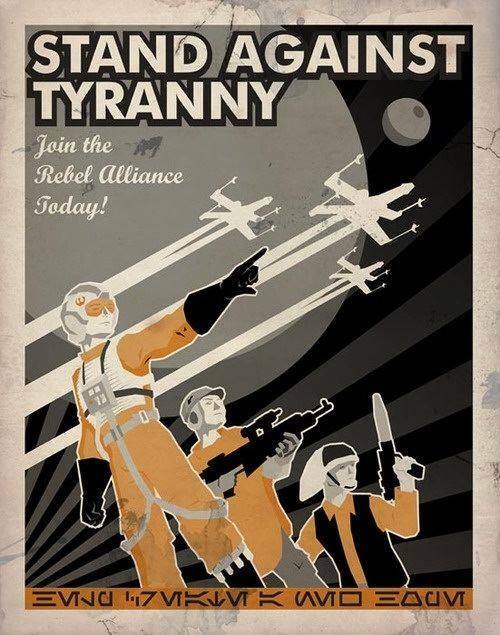 How about the Rebel Alliance? Truth is a matter of perspective, even if the facts are clear. That is one thing that must always be remembered when discussing a topic, any topic. Two people may not disagree about facts, but simply the truths that arise from said facts. Simply because a person may disagree with your conclusion doesn’t mean they dispute the facts. Example: I dispute the idea government is needed to combat global warming (or climate change or whatever they’re calling it now), but that does not mean I dispute the idea the world is slightly warmer than a few years ago.